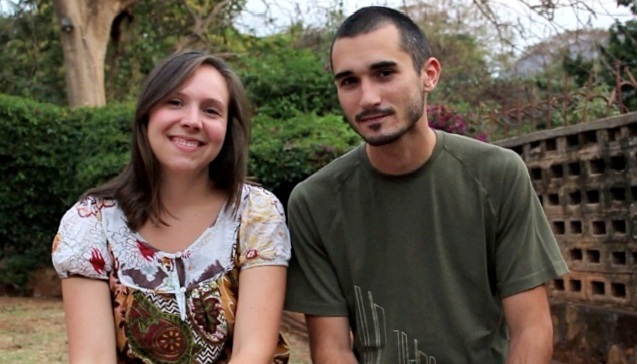 Last week I shared a story about a young couple that had just started their missionary experience in East Africa. I was very happy to hear how well their first six months went in their new country of residence. They sounded like they got a good start to learning Swahili, making new friends, and beginning their time of ministry over there. I also shared the fact that things did not go quite so well for us when our family went over in 2006. One of the things that was taken for granted, both by ourselves and those with whom we would work, was that we would do well very quickly since we had already served as long-term missionaries in Papua New Guinea. What we all neglected to realize was that there are huge differences between life in PNG and life in Africa. 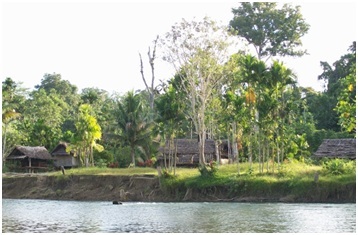 In PNG, our family lived in a remote jungle village of about 200 people and learned a Papuan language slowly over the first couple of years. Whereas in Africa, we were in a city of about 200,000 people and had to start communicating in Swahili within the first few days we were there. That is why an orientation to the mission field is so important. I am very thankful then for the training that our family got in 1997 at the Pacific Orientation Course up on Nobnob Hill near the town of Madang, Papua New Guinea. Following their advice, we landed in Madang (after 52 hours of travel) and were immediately whisked off to the training center on the hill. They believed it was best to go straight to the training center so that we did not “learn any bad habits” by being in the country on our own first. Once we got to the training center, we had more surprises to adjust to. Back then, when emails and cell phones were just really beginning to take off, we were told that there would be no communication with family or friends except by letter. (Really??) The idea then was that if we were to get posted to a remote area that had no contact with the outside world (except by snail mail), then it was important to start practicing what that would be like while in our orientation course. The other big challenge for some was that they didn’t even want us to bring any soft drink cans into the center. (That was hard for Jill who liked Coke so much back then, but more in a minute.) What was more important, was that they helped introduce us slowly week by week into more of the culture of PNG and the trade language Tok Pisin (a pidginized form of English). Not only did we learn to speak with the local Papuans, we spent time with some of the families that lived around the center. We were assigned to one family and we were to visit them once a week and begin developing a relationship with them and learn how the average Papuan lived. We built fires to cook our food, hiked the jungle trails, and constantly worked at language learning. 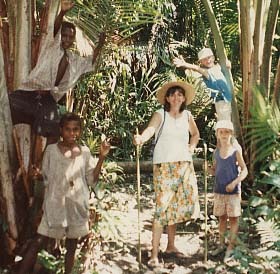 The big “test” for all of us at this orientation course was to go live in a village with local people for five weeks. We lived in thatched roof houses just like they did, built fires to cook on, and lived and worked right alongside of the people. This was definitely a huge challenge, but after preparing for nine weeks at the center, we felt ready to live just like the Papuans. Now back to Coke. I knew what a big thing it was for Jill to have to give up Coke for the 3 1/2 months. Right in the middle of our village living experience we were going to have our “midway visit and evaluation” by the center directors, which just happened to coincide with our wedding anniversary. Well, if I haven’t been able to get the main point across yet through my stories, here it is: to be able to enter into a cross-cultural environment and have the most effective ministry possible among the people, you really need to have a good orientation period into the local language and culture. That is not to say that someone cannot minister to people of another culture without any training. But to really be effective in reaching the people, we need to learn to “live where they live and walk where they walk”. And how much better it is if we are carefully trained and eased into that environment. I pray this article will be of help and encouragement to new and aspiring young missionaries. Entering into an overseas missionary assignment is not as easy as just getting on a plane and moving into a cross-cultural setting and beginning to minister to the people there. I suppose you could try doing that. And I know there have been others that have done this, and perhaps have even done well. But that is probably the exception, not the rule. You see, there are so many cultural and linguistic barriers that separate us from other people, that one must carefully get trained and equipped to overcome these barriers before effective ministry can really begin to happen. Below is an except of a newsletter from a young missionary couple who moved to East Africa back in 2010. Take a look at what they said, being so newly arrived to Africa, and then read about some of our experiences after that. “This month has flown by. We realized it has now been six months since we arrived here in East Africa. It definitely does not seem that long. Looking back, we can see how we have changed, grown and adapted to our new environment. We can also see the incredible amount of blessings God has showered on us. Here’s just a few of the big ones. “Another blessing has been our health. We have not had any sicknesses lately which helps us greatly in accomplishing our work. God has also blessed us in the area of friends. He must have known how much we needed good friends to hang out with and relate to while being in such a different culture, because he gave us an amazing team. It has been so wonderful getting to know them and I really feel like we have made some special bonds. We are also building relationships with a few nationals. It is slow going because of the language barrier but it is most rewarding to be able to connect on common ground. I pray that God is working through us and our slowly improving Swahili to touch their lives. From even just this short report, it is clear that this couple got off to a good start. They talk about making good friends with others quickly, and how they developed relationships with the national people there. It is vital that these things happen in order to be effective in Christian ministry, drawing strength from one’s colleagues, as well as building a common ground of friendship with the local people, using the local language as the bridge into their lives. 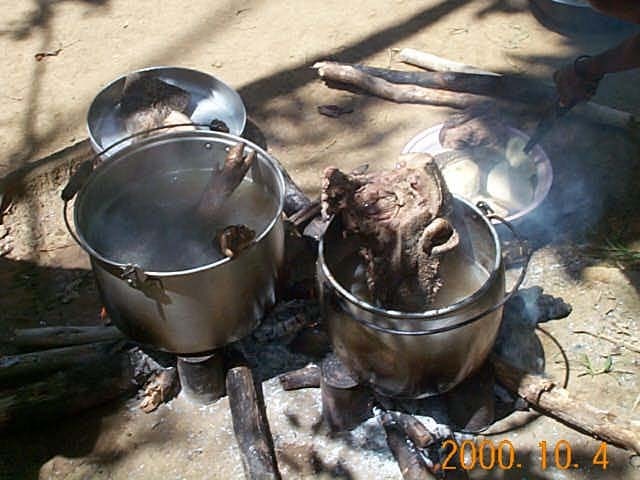 Unfortunately, things did not go as well for our family when we went over to East Africa in 2006-07. There are a number of reasons which all added up against us at that time which I don’t need to go into right here. But probably the greatest of all the mistakes we made, if we can call it that, was that we did not take the time to be properly oriented into the life, culture and language of that country. It had been planned from the beginning for us to attend language school to learn Swahili and learn about the culture of East Africa, just like this young couple mentioned above. We had three choices of where we could do this: two locations were many hours distant from where our mission office was in a large town, or at a language school just outside that town. We chose the school near our office, partly because we did not want to uproot our family with two teen sons again in a short period of time. But also because we knew our office was very short handed at that time and we had come specifically to help relieve the workload and leadership responsibilities. It had been a long time since the leaders had been back home in America and we came to carry the load while they took a break. What ended up happening then, is that we drastically cut short our language and culture learning. I ended up having the most training with just one month at the language school and one month of informal tutoring. I got to the point that I could greet people, and I knew enough Swahili to pay our guards who watched over our house and yard, but not a whole lot more. That had great impact negatively on our ability to build relationships with the African people to whom we had come to minister. We attended a Swahili church, but understood little and had great difficulty being able to worship God, not knowing what was being spoken. We ended up falling back on speaking English, which limited who we could speak with. We do know that God used us to help out our East Africa Branch at that time. But the stress of language and culture barriers were more than we could handle at that time, and our ministry to nationals was minimal for sure. So if anyone is reading this who wants to minister to people in a cross-cultural setting, please take the time to learn as much language as possible first. Then see how God can bless you in that new environment, and use you to be a blessing to the people there. 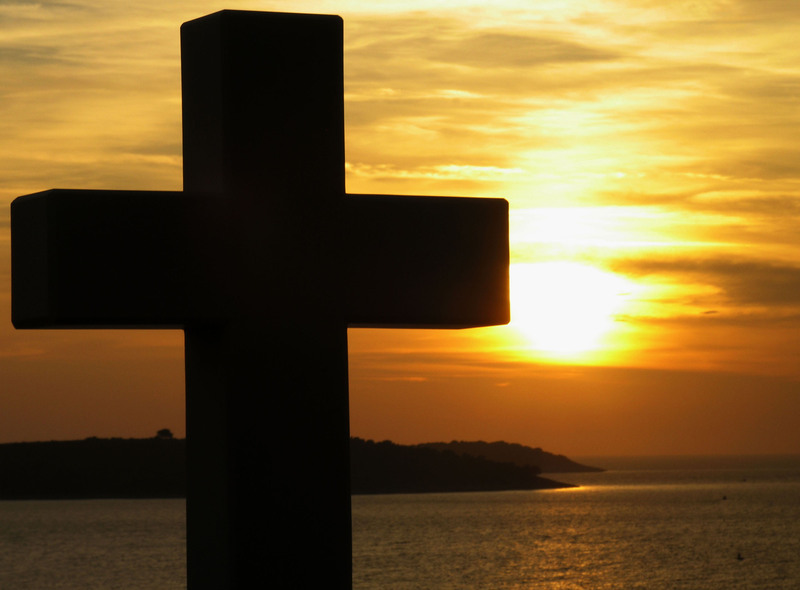 For many years, Christians have talked about “Reaching the Lost”. For some people, that expression has made sense, but I think that many people today would not really know what this means. What exactly does the word “Lost” refer to? In religious terms, it means to be “spiritually lost”, to not know Jesus as the One who rescues us from sin and the punishment of eternal death in Hell. In simple black and white terms, we could talk about those who have accepted Jesus and are “Saved”, and those who have not accepted Jesus and are “Lost”. The reality of “spiritual lostness” in this world is more complex than this though. There is in fact a direct relationship between those who have accepted Christ as Saviour and Lord of their lives and the accessibility to the knowledge of Jesus as presented to us in the Bible. It makes sense that where the Bible has been made available to people in a language that they understand, and where there is a network of churches which use and promote the message of the Bible that there will be people who have had their lives transformed by that message and have a strong faith in Christ. This leads us to the next obvious conclusion. Where there are few or no churches within a distinct language and cultural group, and where there are no portions of the Bible in that language, there will also be very few or no Christians at all in that group. It is this reality that has led our leaders of our mission, Pioneer Bible Translators, to coin the term “Extreme Spiritual Poverty”. In a sense, there is a degree of “lostness” among the people groups of the world, and it has become the mandate of our mission to try to bring relief and the message of the Gospel to these “least reached” people of the world. To get a better understanding of what is involved in impacting the most spiritually needy areas of the world, it is helpful to break it down into three categories of people groups as identified by their languages. According to most of the official counts, there are almost 7,000 language groups in the world. This does not include dialects. These are all considered distinct languages. Of this number, we know that there are just over 2,250 languages that definitely have the need to begin a Bible translation project in that language. This represents over 350 million people who do not have even one verse of the Bible published for them in their language. That is a lot of people who can’t read about Jesus in their own language. Thankfully there are some of these language groups that do have churches established within them, but they are relying on Scripture that is not in the mother tongue of the people. But of these 2,250 language groups, there are at least 900 groups that do not have a church of any portion of the Bible in their language. This represents over 200 million people. It is these church-less and Bible-less language groups of people that PBT is very concerned about reaching with the Gospel message of Christ and whom we consider to be the most extreme spiritually poor people in the world. Now that we know what the need is, what is PBT doing about it? For a number of years now we have been recruiting and sending new missionaries over to these parts of the world which so desperately need churches that use translated Scriptures to transform the people of their language group. God has truly been blessing our mission as we have grown from 185 members to 353 members in just 5 1/2 years. By the end of this year, we expect that we will have doubled in size for the number of career missionaries. Our prayerful goal is to double the number of our personnel again in the next six years. There is so much work left to be done in the world in the area of Bible translation that recruiting new people to be missionaries is crucial to getting the work done. And that was exactly what we were doing this last week. We just held our annual recruitment and training week here in Dallas, which is known as “Pioneer Mission Institute“. For 36 years now we have been training and introducing the work of PBT to people who have an interest in mission work and specifically Bible translation work. This year, we had over 70 students, with just about half that number in each of the two levels, the first level being the “Discovery Track” and the second level doing specialized seminars on practices and procedures for cross-cultural missionaries. I had the privilege to once again teach the introductory linguistics class to the Discovery Track students. I introduced them to such topics as Phonetics, Phonology, Morphology, Semantics, Sociolinguistics, Language Learning and a few other topics. It is always exciting to me when I see other people catch the vision for getting God’s Word translated and available to the minority languages of the world. But more importantly, they caught the vision that there are still a great number of people who are living without the transforming message of the Bible. For it is not just translation work and linguistics that matter, but the lives of people who live on this edge of extreme spiritual poverty that we need to reach. I ask you to be in prayer alond with us that we would find the right people to be added to our mission group that could work together to help bring the Gospel to these last pockets of people in the world who don’t know Jesus, and without a church presence and the translated Word of God, will probably never have the chance to know Jesus. By faith though, we are believing that by 2050 or so, we will have provided a translated New Testament to all these groups and overcome extreme spiritual poverty in the world.